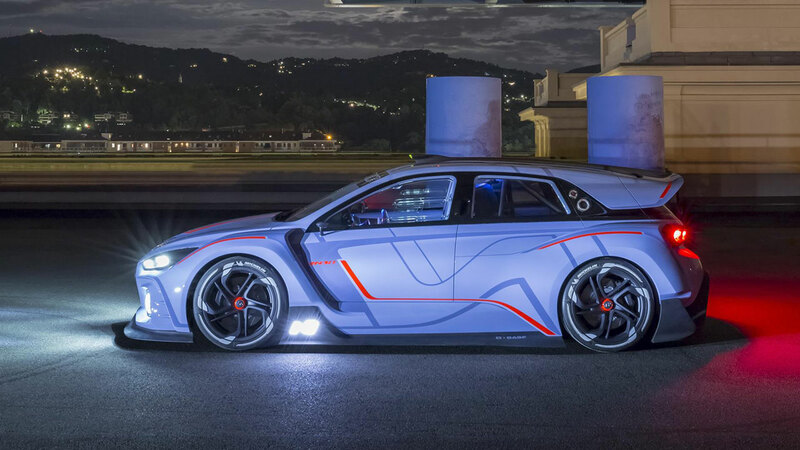 Hyundai Motor unleashed its latest high-performance N concept with the world premiere of RN30 at the 2016 Paris Motor Show. The motorsport-inspired racing concept is developed to deliver passion and pleasure on the track. 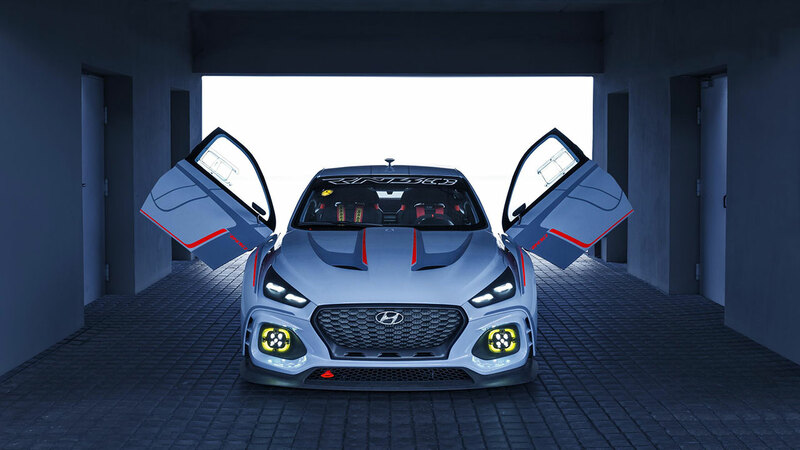 Based on the New Generation Hyundai i30, the RN30 was born as a racing machine, developed in close collaboration with Hyundai Motorsport (HMSG), Hyundai Motor Europe Technical Center (HMETC) and Hyundai Motor’s Performance Development & High Performance Vehicle Division. The striking concept is distinguished by its purposeful aerodynamic design and specialised high-performance technologies that deliver thrilling high-speed driving. The RN30 features specialised high-performance technologies designed to increase excitement for drivers and enable them to tame the most challenging of race tracks. Rev-matching encourages spirited driving by quickly and accurately revising the engine’s speed whenever the driver shifts gear while in sport mode. Adding to the sense of thrill for the driver, the Electronic Variable Exhaust system provides a surge of aural pleasure by emitting a strong exhaust sound consistent with the visceral sensations produced by the rapid acceleration. Other technologies are specifically aimed at enhancing safety and control. The sophisticated electronic limited-slip differential system (eLSD) makes sure each wheel receives sufficient torque, measuring the driving force of the tyres. This helps prevent skidding and ensures fast, precise cornering when navigating high-speed curves – allowing drivers to control this powerful racing machine easily, accurately and confidently. When developing the RN30, Hyundai’s designers and engineers established a new approach to reducing weight and lowering the center of gravity. 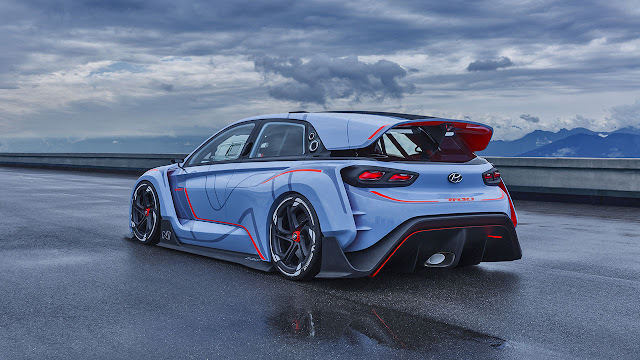 Instead of using carbon fibre reinforced polymer (CFRP) common to most high-performance cars, Hyundai broke the mould with all-new high-performance plastic materials, developed in collaboration with leading global chemical company BASF. This weight-saving innovation is light, highly durable and environmentally-friendly and is used throughout the new concept to help boost handling and acceleration. Inside, redundant parts were removed, while heavier parts sit in the lowest possible position. The centre of gravity is lowered further by pushing back and lowering the seats, with all these elements combining to achieve a light weight, ideal for performance driving. The front design features Hyundai’s new signature cascading grill and high-tech headlamps, which creates a strong, aggressive image when combined with the distinctive daytime running lights. The airflow from the front to the rear passes through the mesh cascading radiator grill and the air intake, not only improving downforce but also optimising cooling for performance driving. On the upper part of the engine hood, a large air outlet hints at the dramatic engine power of the RN30. 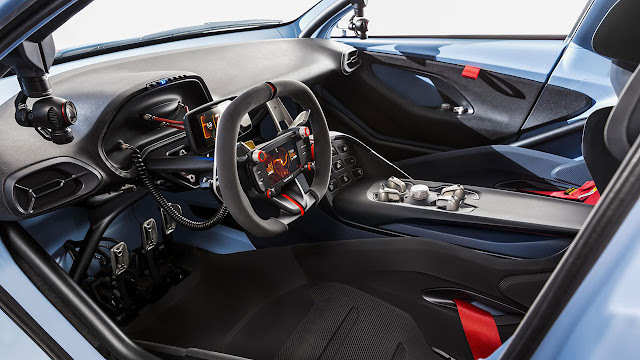 To capture the driver’s reactions and dynamic moments while on the road or track, image-stabilizing gimbal cameras are attached inside each A pillar, with an outside camera attached to the centre fin on the roof. Drivers can create professional-looking racing footage or present their experiences as if on television..
RN30 is the latest in a succession of high-performance sports concepts that point towards the future of N production models, furthering the ‘N’ model characteristics first seen in the Hyundai N 2025 Vision Gran Turismo, RM15 and RM16 concepts. 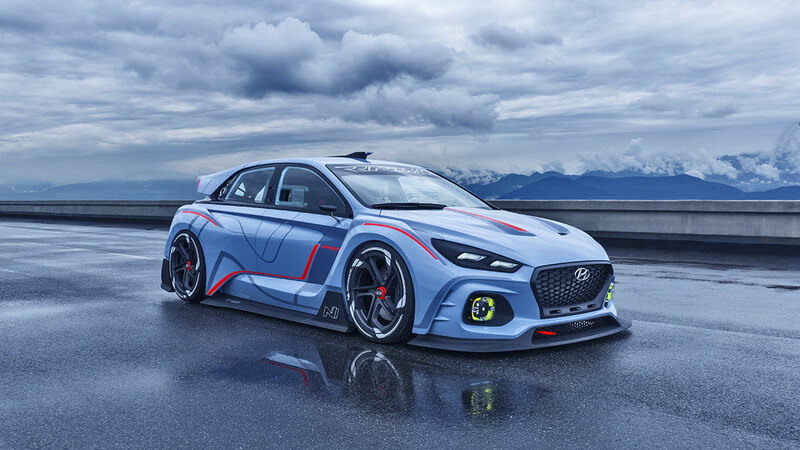 All N performance models draw on Hyundai’s successful motorsport experiences and demonstrate Hyundai’s desire to put thrilling driver experiences at the heart of new car developments. The i30N model will soon be available next year, making our passion for high-performance driving accessible to everyone. All N models are developed by passionate experts in Namyang, the heart of Hyundai Motor’s global R&D network – then pushed to their limits at Nürburgring, the world’s most challenging race track. The N logo represents the chicane of a race track – where the balance of cars is proven rigorously.